Slate/SurveyMonkey binge-watching poll: How do people gorge on TV? 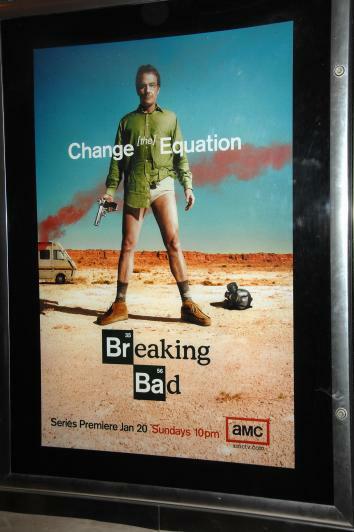 Breaking Bad helped propel binge-watching. The idea of “binge-watching” television shows has grown from a pastime for the Internet-savvy minority to a full-blown cultural phenomenon. More than three-quarters of online video watchers surveyed in a recent Slate/SurveyMonkey poll said they have binge-watched a TV show With growing fanaticism surrounding serial dramas like Breaking Bad, Game of Thrones, Scandal, Homeland, and Boardwalk Empire has been compounded by how readily stream-able TV shows are. Respondents also said they prefer the endurance test that binge-watching offers—most preferred watching hour-long dramas more than shorter programs. Binge-watchers are also discerning viewers. High production quality was the reason most people—64 percent of respondents—would binge-watch a show. This makes sense because, as Alex Soojung-Kim Pang argues, binge-watching lends itself to more in-depth discussions of story arcs and character development. 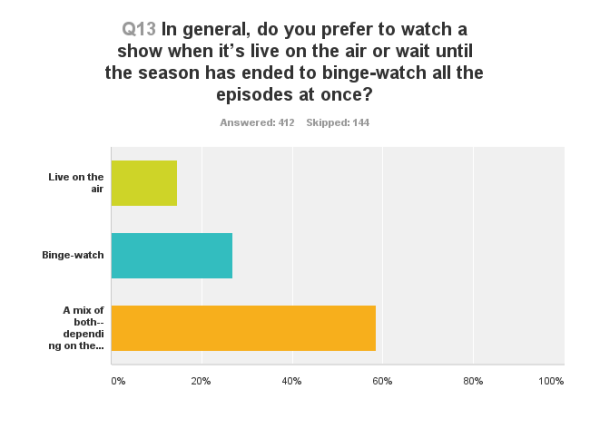 People were more split on how much attention they paid when bingeing on a show. 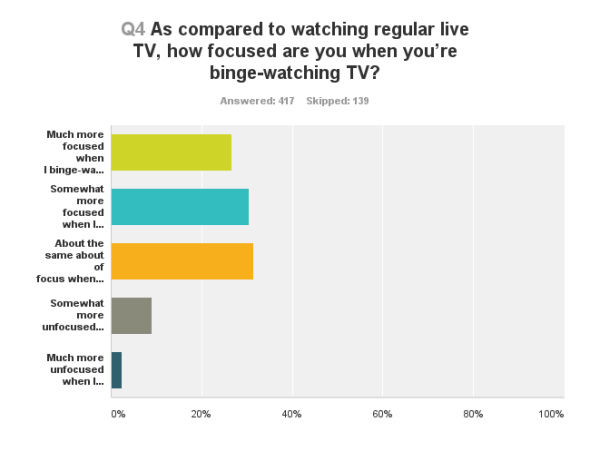 Fully 57 percent said they felt “somewhat” or “much more focused” when binge-watching, while 31 percent said they felt about the same. And 68 percent of respondents said they focused more when binge-watching versus watching a YouTube video. This is a TV-centric phenomenon. Fifty-seven percent respondents said they do binge on movies or music, but 51 percent said they don’t binge on other forms of media at all. Viewers also said they found binge-watching to be a more engaging experience than other video-watching methods—58 percent pay more attention to shows when they’re binge-watching, while 32 percent say they pay about the same amount of attention. The most popular binge-watched show was Breaking Bad, followed by Orange Is the New Black, Dexter, The Walking Dead, and Game of Thrones. That’s good news for Netflix, AMC, and HBO, which are all coming back with new seasons of their signature shows. While binge-watching may be a boon to networks and streaming services, it’s bad news for another industry: advertising. 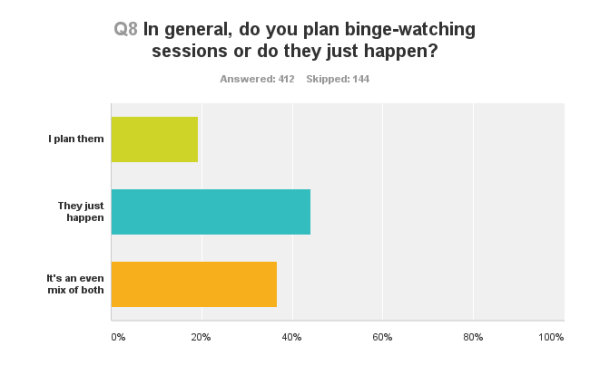 Most respondents said they enjoy having the ability to mute or fast-forward through commercials when binge-watching, as opposed to waiting them out when watching a show live. Even though most respondents said they pay more attention while binge-watching, they also admitted to multitasking during a show: doing homework, knitting, checking Facebook, analyzing the cast’s IMDB pages, breastfeeding, and generally putzing around the house.